West Brom boss Tony Pulis masterminded a victory against his former club as the Baggies edged out lacklustre Stoke. Brown Ideye headed the decisive goal early on but the hosts could have had more in a dominant display that lifts them 11 points clear of the drop zone. The visitors, whom Pulis managed from 2006 until 2013 and moulded into an effective Premier League outfit, failed to muster a clear chance. Peter Crouch's blocked header was the closest they came to equalising. Stoke have carved out a reputation as West Brom's bogey team in recent years, winning all five of their previous Premier League visits to The Hawthorns. Four of those victories were plotted by Pulis, but this time the tracksuited taskmaster tasted success in the opposite dugout as he continued his impressive start as Baggies boss. West Brom has lost their five previous Premier League home games to Stoke and had beaten the Potters just once in 16 attempts before today. The Midlanders have now kept eight clean sheets in the 13 matches since Pulis took charge, while this was their fourth successive home win in all competitions. It was also an impressive response to painful successive defeats by local rivals Aston Villa in their previous two games, culminating in last week's exit from the FA Cup. 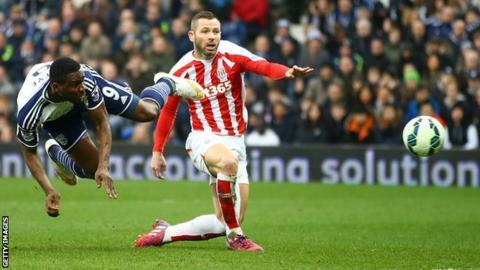 Instrumental in West Brom's revival under Pulis has been Ideye, who the manager attempted to offload in January following the Nigerian's disappointing start to the season. But since the last-minute collapse of a deadline-day move to Qatari club Al Gharafa, Ideye has scored five goals. For his latest, the striker nipped ahead of the flat-footed Phil Bardsley to nod home Craig Gardner's teasing cross. The Baggies proceeded to brush aside an in-form Stoke side who had won their last three matches. Berahino flashed a shot across the face of goal, before Begovic did well to deny Ideye with a fine low save after the break. Stoke threatened sporadically, with Crouch seeing a header charged down after Ben Foster fumbled a cross. But it was a largely comfortable afternoon for Pulis - with the relegation fears he inherited when he replaced Alan Irvine at the start of the year now appearing to be all-but extinguished. West Brom manager Tony Pulis: "It was a very good performance - the disappointing thing is that we didn't get a second goal. "The players have been through the mill the past couple of weeks with bad results against Villa, but not bad performances. "This was a big win for the supporters after having to take that on the chin." Stoke City manager Mark Hughes: "It wasn't good enough today. We started slowly, conceded an early goal and didn't really improve. "There's no point me trying to dress it up differently. West Brom coped comfortably with our threat, which was minimal. "We hope today was just one of those games." Brown Ideye also had a goal disallowed for offside following an Asmir Begovic fumble. Joleon Lescott charged down Peter Crouch's effort in a rare Stoke attack. Match ends, West Bromwich Albion 1, Stoke City 0. Second Half ends, West Bromwich Albion 1, Stoke City 0. Stéphane Sessegnon (West Bromwich Albion) wins a free kick on the left wing. Substitution, West Bromwich Albion. Chris Baird replaces Saido Berahino. Boaz Myhill (West Bromwich Albion) is shown the yellow card for a bad foul. Foul by Boaz Myhill (West Bromwich Albion). Substitution, West Bromwich Albion. Jonas Olsson replaces Brown Ideye because of an injury. Brown Ideye (West Bromwich Albion) wins a free kick in the defensive half. Attempt saved. Peter Crouch (Stoke City) header from a difficult angle on the left is saved in the top left corner. Assisted by Phil Bardsley with a cross. Offside, Stoke City. Asmir Begovic tries a through ball, but Marko Arnautovic is caught offside. Corner, West Bromwich Albion. Conceded by Asmir Begovic. Attempt saved. James Morrison (West Bromwich Albion) right footed shot from outside the box is saved in the top right corner. Assisted by Darren Fletcher. Darren Fletcher (West Bromwich Albion) wins a free kick in the defensive half. Attempt blocked. Craig Gardner (West Bromwich Albion) right footed shot from outside the box is blocked. Assisted by Brown Ideye. Corner, West Bromwich Albion. Conceded by Geoff Cameron. Attempt blocked. James Morrison (West Bromwich Albion) left footed shot from the left side of the box is blocked. Assisted by Chris Brunt. Attempt blocked. Saido Berahino (West Bromwich Albion) right footed shot from the centre of the box is blocked. Assisted by James Morrison with a headed pass. Substitution, Stoke City. Mame Biram Diouf replaces Jonathan Walters because of an injury. Attempt saved. Brown Ideye (West Bromwich Albion) right footed shot from the left side of the box is saved in the bottom right corner. Assisted by James Morrison.